Raine’s Warrior Combat Gear is designed for the MOLLE attachment system. 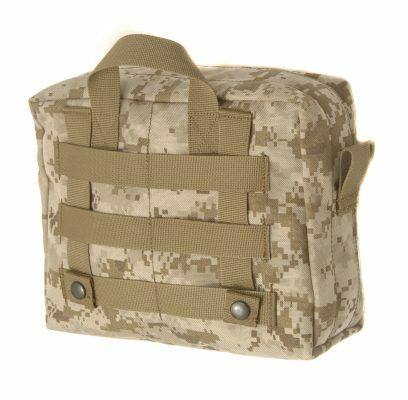 MOLLE is an acronym for MOdular Lightweight Load-carrying Equipment. It is used to define the current generation of load-bearing equipment and rucksacks utilized by the U.S. armed forces and its use is also growing in the British Army in the form of the Osprey Modular systems. The system’s modularity is derived from the use of PALS webbing, rows of heavy-duty nylon stitched onto the vest and to allow for attachment of various MOLLE-compatible pouches and accessories. This method of attachment has become a de facto standard for modular tactical gear, replacing the click and stick system used in the earliest modular vest systems (which is still in use with most Western police departments). Raine’s MOLLE attachment can also be converted to a belt mounting configuration. For a complete list of Raine’s products, go to www.raineinc.com. This entry was posted in Raine's Products by raineincblog. Bookmark the permalink.